Blockupy International supports the convergence of struggles that is currently taking place in France against the Labor Bill and its system and austerity policies which are creating a society of injustice, precarity and inequalities. The movement has continuously grown over the last two months of mobilisation in the streets, on the squares, and in the workplaces. The government is pushing harder to impose its law against the population. After using violence and criminalization against the movements, now the government is also silencing political and parliamentary debate by using the article 49.3 of the constitution, which brings into play the defiance against the government. This is an instrument that Hollande strongly condemned ten years ago for its undemocratic character during the strong and victorious mobilisation against the CPE, which was another attempt to precarize young people. He seems to have forgotten what democracy looks like! There is no doubt about who really benefits from this law. The employers and financial oligarchy seem determined to destroy workers’ rights, in collusion with the government to impose their agenda by force. We know that this bill is similar to many others which were unfortunately introduced to other European countries over the past years and decades, and how such bills have intended to dismantle rights and public infrastructure, that generalize precarity and eventually normalize “austerity” as the taken for granted societal scheme. In Greece, the memoranda imposed by the Troika left a labor wasteland. The minimum monthly wage is now 581 € (511 € for the young under 25). Firing has become very easy; compensations are not paid. Collective bargaining has practically been cancelled. The social security system is almost destroyed; the working classes are confronted with massive pension cuts. That’s what Troika’s policies and pressure signify. In Italy, the Jobs Act of 2015 institutionalized a regime of wage in which extreme flexibility, informal labor, employability, and precarity are meant to further exploit migrant, precarious and industry workers. Abolishing all the social protections for workers, the Jobs Act aims, like Loi Travail, to put precarity in the centre of the neoliberal financial model. From these short examples, we can clearly see that the labor bill in France is part of a larger European scheme. And we also see, that in the face of this disastrous attempt to “harmonise” labour laws in Europe, only a transnational opposition, from below, can be successful against the current economic, social and environmental dead end. 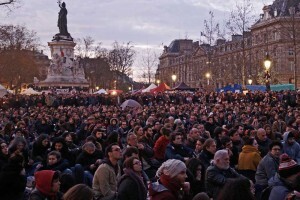 Our struggle against widespread precarity and normalized austerity, the struggle against the Troika, national elites and oligarchies is necessarily linked with the struggle against internal and external borders; it is linked to all those struggles which are trying to find new ways and dynamics of transnational protest and strike, and which are taking the squares starting from the French mobilisation. of social and political rights, we will fight back! We strongly support the Global Debout and the momentum it creates for all of us! We will take part in the ongoing debates and actions coming from the squares, including the next dates of mobilisations against the law between the 17th and 19th of May called by the unions, the strike of the railway workers on the 18th of May as well as the struggles of all sectors against this generalization of the precarity.